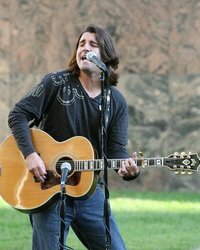 Mike Verge is a singer, songwriter, and guitar player whose music has been compared to acts such as Tom Petty, John Mayer, the Black Crowes and the Jayhawks. This Berklee College of Music graduate and Boston native has played gigs from Portland, Maine to the Caribbean, from coffee shops to arenas. In 2007, Mike wrote and recorded the ballpark anthem "Let's Go Red Sox." The song was played during the Red Sox games at Fenway Park throughout the 2007 season and has remained a Fenway favorite to date. As the team entered the playoffs, the song caught the attention of the FOX television network, and they ran an exclusive feature on Mike and the song, as well as playing "Let's Go Red Sox" during Fox's broadcast of the 2007 World Series. Mike was also commissioned to write a song for the opening and dedication of The Garden of Peace, a memorial for homicide victims in downtown Boston. Mike wrote and recorded "The Garden", and performed it live at the ceremony with a 35-voice gospel choir. Mike's original holiday song, "Let It Be XMAS" has generated rave reviews and outstanding press, including a live performance on the Fox 25 Morning News on Christmas Eve, and his live performance of the song with the Boston City singers at the Boston Common Tree Lighting. Mike has enjoyed success as a songwriter for several independent films. Mike was approached by legendary producer Jack Douglas (John Lennon and Aerosmith) to write a song for the independent film, "This Thing of Ours" starring James Caan. Mike and his band was handpicked by Hootie & the Blowfish front man Darius Rucker to open for the Blowfish's sold-out New England appearances. Mike's songwriting style has attracted the attention of The Band drummer Levon Helm, who offered him an opening slot on the Boston leg of his recent tour. Verge has also opened for several other big-name acts, including Dave Davies (The Kinks), Livingston Taylor, Buck Cherry and Cheap Trick.